Omega Healthcare Investors (OHI) invests in healthcare facilities, principally long-term healthcare facilities in the United States. It provides lease or mortgage financing to qualified operators of skilled nursing facilities , as well as to assisted living facilities , independent living facilities, and rehabilitation and acute care facilities. 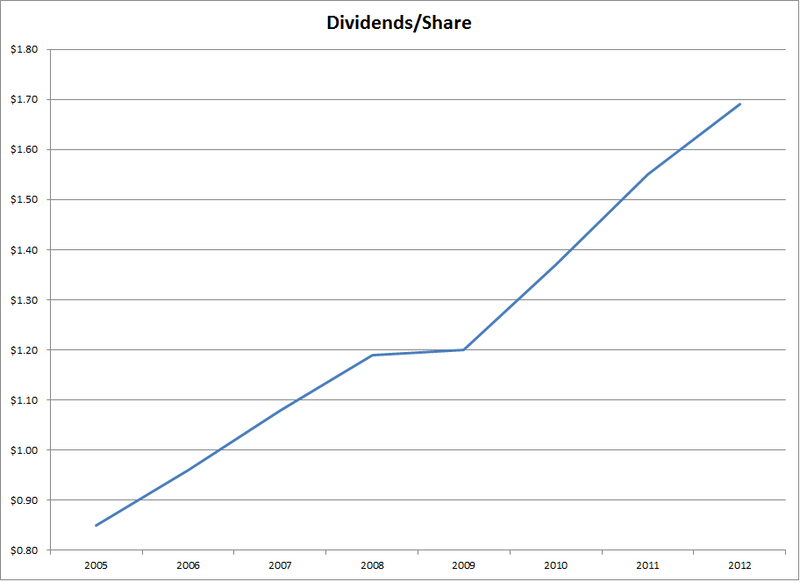 This real estate investment trust has raised dividends for ten years in a row. Back in March, I initiated a position in Omega Healthcare Investors and Digital Realty Trust (DLR), after I sold my position in Universal Healthcare Realty Investors (UHT). One of the reasons why I have been hesitant to look at Omega Healthcare before, was the fact that the REIT cut distributions in 2000, and eliminated them for 2001 and 2002. 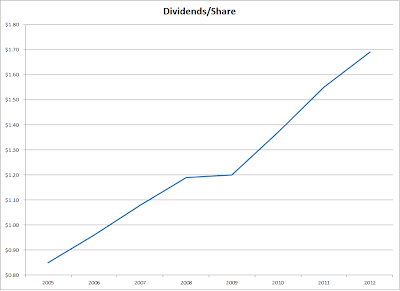 The risk with a company that eliminates dividends once, is that the conditions might appear again, thus causing the firm to become a repeat dividend cut offender. In this article, I will review the operating performance over the past decade, and conclude on whether the company is a good addition to an investor’s portfolio.I will evaluate this REIT using the five criteria I use as outlined in an earlier article this week. 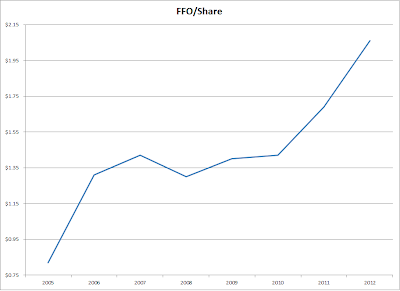 Since 2005, FFO has grown by 150%, while the dividend has doubled in the same period. I usually prefer a margin of safety in dividend payments. At 82%, the FFO Payout ratio is sustainable. 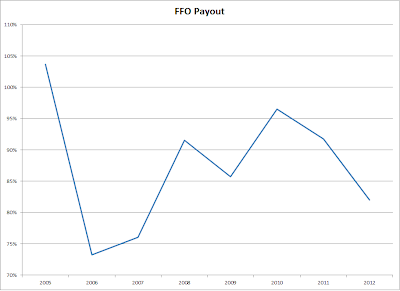 A lower payout is always a plus, because it allows the company to absorb any short-term fluctuation in FFO, which lowers risk to dividend payments. Future distribution growth would be driver by growth in investments that the company has been making over the past decade. Acquisitions of property have accelerated starting in 2009, with over $1.30 billion invested over the period. The REIT’s strategy is focused on pursuing selective investments in senior care facilities. Skilled Nursing Facilities will be a growth industry for the next three – four decades, as the population ages. For example, the proportion population aged over 85 years is estimated to increase from six million in 2010 to 10 million by 2030 and 15 million by 2040. Another positive factor is the stable occupancy of the company’s properties. 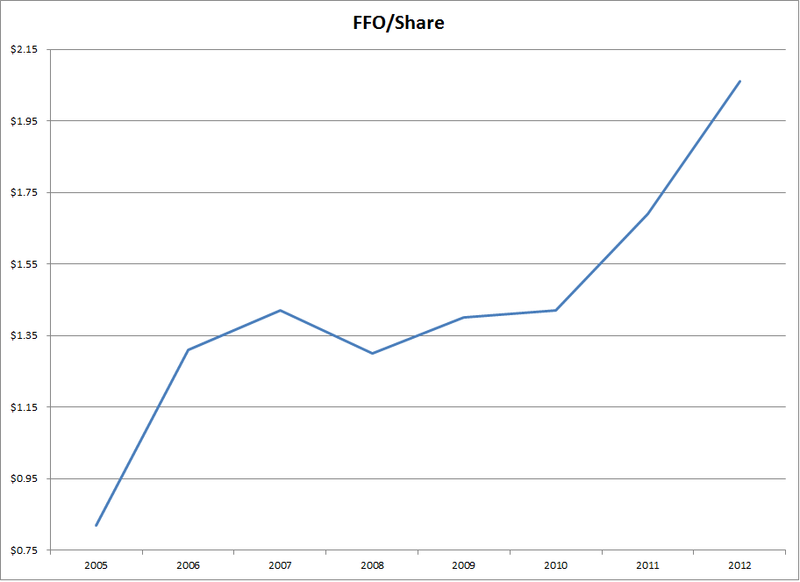 Occupancy has increased from 80% in 2001 to 84% in 2011. A stable and growing occupancy percentage is a plus, and shows that management has maintained quality of new assets being acquired. The REIT will face a potential obstacle in 2018, when 19% of its leases expire. 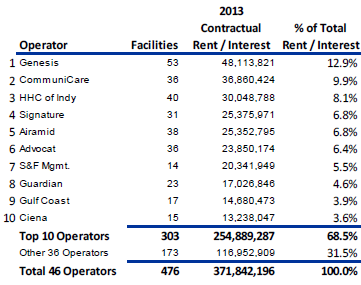 The ten largest tenants account for 68% of revenues. Generally, I prefer that there isn’t a very high concentration of tenants, and 68.50% is in the top range of what I am willing to tolerate. All of the REIT’s properties are leased under 5 – 15 year lease terms, and are triple-net leases. The lease terms always have renewal options. Under a triple-net lease, the tenant pays net real estate taxes, building insurance and net common area maintenance, in addition for paying rent. Omega Healthcare disclosed that a significant portion of its operators’ revenue is derived from governmentally-funded reimbursement programs, primarily Medicare and Medicaid. According to The Alliance for Quality Nursing Home Care, as of January 2013, approximately 70% of SNF residents depend upon Medicare and/or Medicaid funding for care. With the focus on cutting federal deficits, this could slow down growth in reimbursements. Generally, debt is one item that could derail a real estate investment trust’s ability to pay distributions. With Omega Healthcare Investors, there isn’t a significant amount of debt to be paid over the next five years. In addition, the lower interest rates can afford the company to renew debt at lower rates or to utilize low current rates if it chooses to draw from its line of credit. Currently, I find Omega Healthcare Investors to be attractively valued at 15.50 times FFO and yielding 5.70%.